Shelf Inflicted: Do you have free will? I am an agnostic which means I am firm in my belief that I have no idea what to believe. I don't know what is true and what isn't and no one, no matter how strong your faith, or how strong your lack of faith is.....you don't know either. You don't know what happens to you after you die. You pretty much have to die to find that out. You may really, really, really believe little alien souls are attached to your body and making your life miserable, and that the only way to make it all better is to blow your life savings in Clearwater Florida trying to rid yourself of these little bastards by way of a weird looking machine. It still doesn't make it true, it's purely your free will to believe it is. Next to art, and generally making things that are pretty and/or interesting, I'm really fascinated with science. 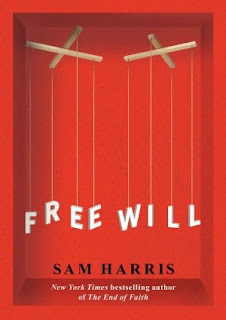 Books on the brain are something I generally gravitated towards which is why I picked up Free Will. Sam Harris is obviously a very intelligent man he generally seems to know what he is talking about. But I can't digest what he is dishing out in Free Will. Basically, if I am following what he is saying (and it is possible I'm NOT) human beings have no free will.....excuse me? Apparently there have been studies that prove that when we make the decision to do something our brain does the deciding first before we are even aware of our decision consciously. This is done with some fancy imaging machines that catch a blip of some sort go off before you do what you're going to do. So, of course we don't have free will. Somehow because we don't know what makes our brain decide something before we become aware of what it is that we are deciding we aren't actually deciding anything at all. Uhhh......ok? To me this strengthens the argument that we are something more than just our brains. Maybe....just maybe, what is making the brain do it's business is the energy (or soul if you like to call it that) that animates these meat suits we walk around in. Or not! I don't know but I believe someday science will figure out what that's all about. Science advances insanely fast. Right now I can probably take over a third world country with my Ipad. I can't even imagine what will be invented or discovered in the near future. So for Sam to jump to this conclusion seems premature. It is more likely we have control over our decisions and that we are responsible for them than not. I believe we have free will to do the right thing despite our circumstances growing up.